For three blistering hot and bloody days in 1863 at the Battle of Gettysburg in Pennsylvania, the Civil War could have gone either way. Could General Meade hold the line, or would General Robert E. Lee prevail in bringing the war to the North? It was the Union Army’s dramatic repulsion of the Confederate’s Pickett’s Charge that changed the tides of war. 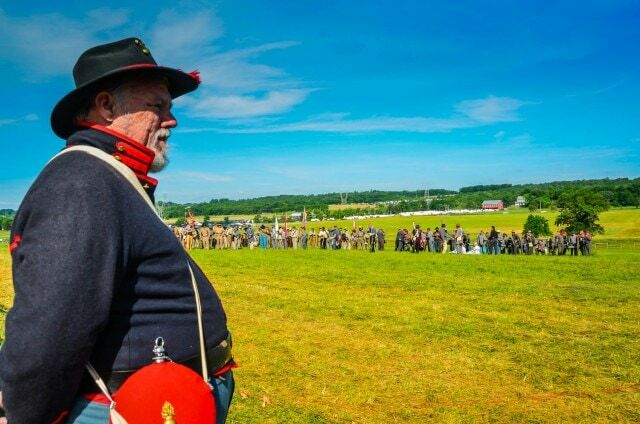 On the last day of the 150th Anniversary of the Battle of Gettysburg, we gathered with thousands of re-enactors and spectators to commemorate this famous battle, but also to bear witness to all who sacrificed and supported soldiers on and off the battlefield. 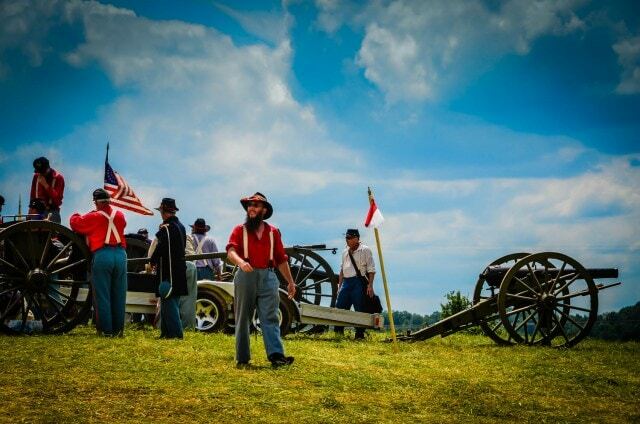 At least 12,000 re-enactors, including 300 registered from 16 foreign countries, and more than 400 horses staged a week’s worth of battles and other events during the 15oth Anniversary of the Battle of Gettysburg. 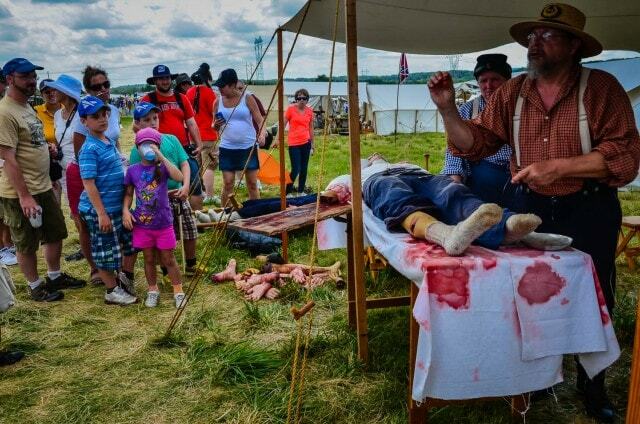 Off the battlefield, more than 700 living historians set up demonstrations on topics ranging from timeless embalming techniques to Civil War medicine. I waited until the day of the event to purchase tickets, so we were left to set up camp chairs on the periphery of the battlefield while our friends were seated in the grandstands. Our view of the battles was therefore framed by the hats and hairdos of the persons in front. As Pickett’s Charge ranged on, we could feel the booming cannon fire and we could see their smoke rings in the air, but I only caught the actual battle in hurried peeks as I rose to snap a shot or two. No matter. Even with obstructed views, we experienced the battle through all our senses. It wasn’t just that we could hear the fighting, those cannon blasts had me jumping in my seat while the smoke hung in the air, setting off coughs and tearing eyes. And that relentless sun. We were informed that the original battle was also waged on a hot summer day very similar to ours. So while we slathered on sunscreen and sipped on well-iced lemonade, we could well imagine how difficult it must have been to withstand the heat in wool uniforms. When a rain storm rolled in just as the reenactment ended, I for one welcomed the cooling shower. It seemed a fitting end to a sensational event. Planning to visit Gettysburg? See Gettysburg, PA; Beyond 150 Years on our sister publication, Getaway Mavens.